Some of you may have been following the story of Oscar Pistorius, the Paralympic sprinter who has been trying to qualify for the Olympics in Beijing. 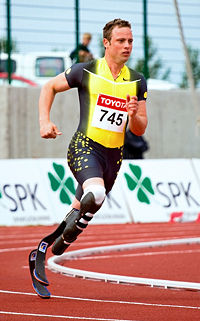 Pistorius made the shift to the 400m, which his coach believed would mitigate his slower starting speed due to his prosthetic limbs. The results in his races have been astounding. In his last chance to qualify, Pistorius shaved 11 hundreths of his personal best time to go 46.25, which was unfortunately just off the Olympic A-standard of 45.55 that the 21 year old South African needed to hit. South Africa could still select him to participate in the 4×400 relay when they announce their selections for the team. Pistorius has been locked in a legal battle with the IAAF, who believe his prostheses give him an advantage. Fortunately, Oscar has a good group of lawyers and engineers on his side arguing his case. Obviously there will come a time when we will have to address the issue of “bionic” limbs, but the physics in this case are clearly on Pistorius’s side. Pistorius has had a fantastic bit of success racing against able bodied competitors, with his best finish being a 2nd place in the B final of the Golden Gala meet. At only 21, I hope he keeps getting faster, and I hope I’ll get to watch him in London in 2012. ESPN has a bunch of good articles on his quest. The latest one can be found HERE. Pistorius is a Paralympics Gold Medalist (Athens 2004, 200m) and two time World Champion (2005 100m and 200m). He’s a certified BAMF in my book.